Top 4 Rules of Departmental Interview must follow before interview. Top 6 “Model Office Interview Examples” should be prepare before Interview. Guidelines for “Office Interview” Primary Knowledge, Business Psychology and Tactfulness. 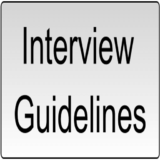 Guidelines for “Business Interview” Primary Knowledge, Business Psychology and Tactfulness.